Is there anything in the world more satisfying than the smell of freshly baked bread? Any time I get a whiff of that heart-warming deliciousness, all the best of my childhood memories come flooding back. If there's bread in the house, I don't need to worry too much about breakfast, lunch, or even dinner. If there's bread around, I can just make toast if a new dinner recipe fails. 😉 It's culinary perfection! And this sourdough sandwich bread is my tried-and-true staple. I could make it in my sleep! Is there anything in the world more satisfying than the smell of freshly baked bread? This sourdough sandwich bread is my tried-and-true staple. I could make it in my sleep! Makes 1 loaf. Whisk water with active sourdough starter until dissolved and frothy. Cover and leave at room temperature for 4 to 8 hours, or until it becomes soft, airy, and puffy with visible bubbles. Whisk warm water with sponge. Mix with a spoon until no dry bits remain. The dough should resemble thick pancake batter. Cover and leave at warm room temperature until it rises well. This should take between 2 and 5 hours, but no longer to avoid over-souring. Then, prepare a bread pan. I prefer one that allows a lot of room for vertical expansion. I also line my loaf pan with parchment paper to prevent possible sticking, but it's not necessary. 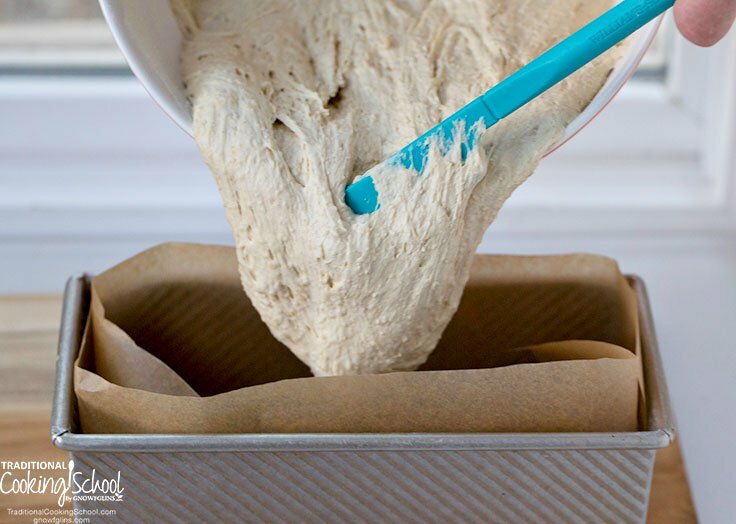 Transfer dough into bread pan. Let rise for 45 to 60 minutes. Then preheat oven to 375 degrees Fahrenheit. Finally, cool on wire rack. I keep my dough at an almost batter-like consistency. This way, it produces dough that doesn't crumble and holds together well. Perfect for sandwiches. Plus, no kneading necessary! If you have kids, you know how hard it can be to sell them on whole grain bread if they've already tried the white stuff. This recipe is my solution. I use all-purpose einkorn and spelt flour to keep the bread light in color. Then I add whole ground oat flour, which is also very light, yet adds great fiber and all the wonderful health benefits of oats. Alternatively, using just whole grain flour yields loaves that are more dense, but delicious nonetheless. Spelt flour (all-purpose or whole ground) makes much taller loaves, while einkorn flour by itself produces short ones. Also, feel free to use up to 50% of non-gluten or low-gluten flours such as oat, millet, or rye (any more will change the bread consistency too much). I personally don't care for rice flour in this recipe, but that's just my preference. If you prefer, use dry yeast in place of sourdough starter. Finally, this sourdough sandwich bread doesn't brown much at the top, especially when using oat flour. If you want more browning, bake at 420 degrees Fahrenheit for the first 20 minutes. Higher temperatures create a crispier crust. The crust will soften eventually if the bread is stored tightly covered. 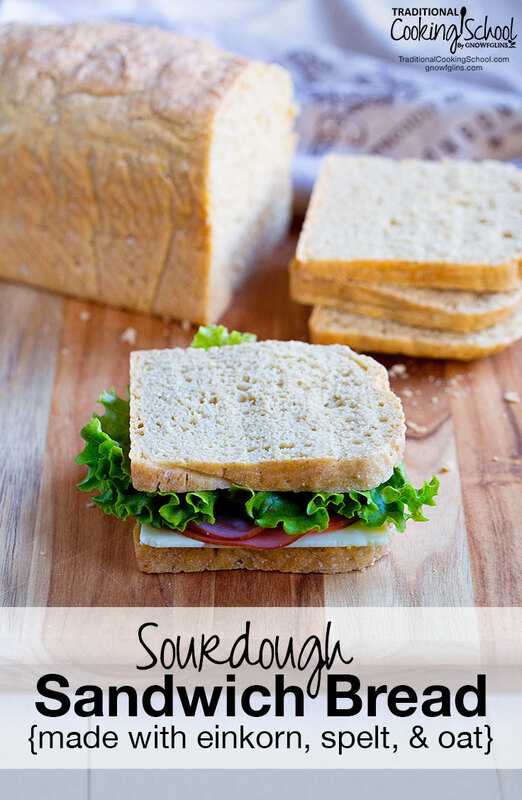 Will you try this sourdough sandwich bread? Can’t wait to try this! Love Wardeh’s no-knead einkorn bread but would like to find one we love for sandwiches. Can I grind oats into flour and, if so, how finely does it need to be? I have made ground oat flour by putting rolled oats into my food processor. Works great! I’m gluten intolerant…have heard of einkorn flour – thinking it’s the ancient one that’s ok for me? I would love to try this recipe but I am unable to get it to print in an usable format. Usually by hitting the print button the photos are removed or your have the option to remove them to save ink. This printed with large blanks where the photos are. Any suggestions how to get a clean concise recipe from this page? Copy and paste the recipe into a Word Document. That usually works well for me. Would only soaking the whole amount of flour for 2-5 hours be effective to deactivating the phytic acid? I’d like to know if there’s a secret to getting nice, even slices! My mother always turned her loaves on their sides to slice, but i still can’t achieve uniform slices. 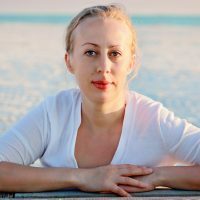 If there is a secret – it’s well kept away from me! I still struggle 🙂 I do like the idea of slicing sandwich bread from the side, thanks for the tip! Thanks, Shauna, never thought to Google it…there are all kinds of slicing guides online at various price points. I’ve finally gotten my sourdough starter to the place where I can bake, and this is my first choice to try it! This bread looks so good! My sponge is resting on a heating pad on low with a towel over it right now (our house is old and cold), and I can’t wait! We’re having an unusually chilly snap, and I don’t want to fire up a heater… Thanks for mentioning the heating pad, that’ll take the chill off the countertops! I have a question. I’m a sourdough newbie, and this was the first recipe I tried. It tasted good, but was very heavy, wet, and gummy inside. I baked it much longer than stated, and it never seemed to get done. Did I not let it rise long enough? I’ve heard of putting sourdough dough in the fridge overnight and than baking — would this have any effect on non-wheat flour sourdough bread? Or does the fact that I used a white wheat sourdough starter have any effect? I liked the taste so much I want to try again, but these flours are so expensive, I don’t want to waste them again. Hi Susan, I just had a flashback to the time I started baking with sourdough. I had so many mishaps I almost gave up. The reason for gummy inside may be several things. ~ Was your oven pre-heated? The reason pre-heating is important, especially with high moisture dough like this, is because high heat reacts with water in the dough to create steam reaction, which gives airiness and open crumb to the bread. 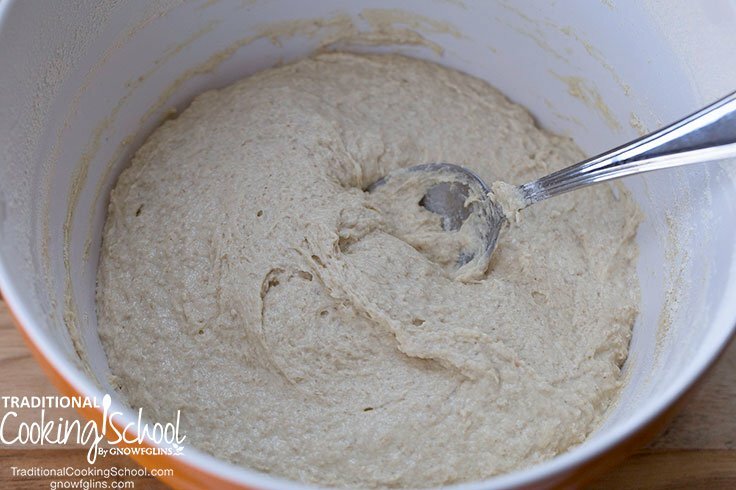 ~ The other reason might be overproofing the dough – fermenting it longer than needed. It’s a fine line to learn when enough is enough, and it comes with observation and experience. 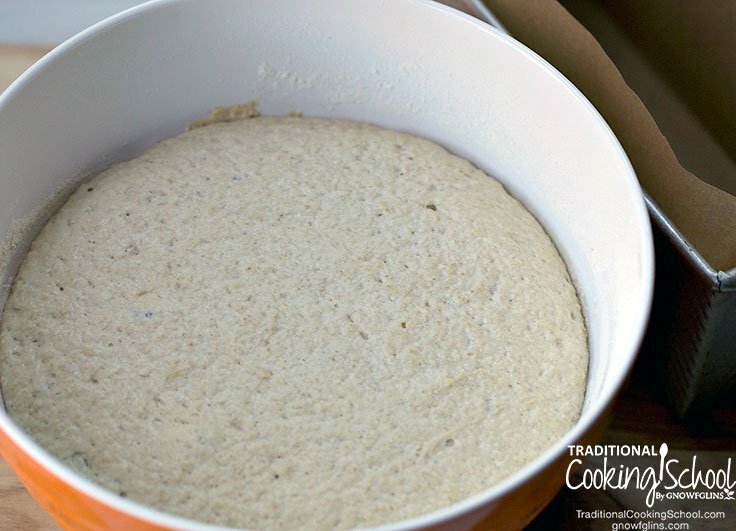 If you decide to try it again, I would recommend fermenting a little less.It’s especially true with proofing the bread in the pan – it you leave it for too long, it will reach its peak, then collapse visibly, which would certainly give you a gummy bread. I wouldn’t go more than 30 minutes, and better less. You can also bake it right away without the pan rise. ~ The fact that your starter is wheat and not rye shouldn’t affect the process. What might make a difference is if a starter is not active enough. ~ You can try substituting oat flour for more wheat flour. ~ The reason for refrigerator fermentation is to slow fermentation rate and reduce sourness. I do it every now and then when I know my schedule will be hard to predict. Hello! I was so excited to try this recipe. I made it exactly according to the recipe with same flours and everything. I’m using a rye starter that is very active ( have to feed it three times a day) It is so active that if I feed it at midnight it is past the peak in the morning when I wake up to make my bread, but definitely has only fallen a bit (maybe a quarter of the way or less) I keep getting a gummy dough though! Is it because I’m not getting my starter at it’s peak? I tried letting it proof less. One thing I did notice is that once I mix the flour in, it looks like the consistency you have here, but after it proofs, it seems to be much thinner than what you have a picture of going into the loaf pan. It pours rather easily. Could this be the issue? Why would my dough (batter) thin out so much during the proofing? I only proofed for about 3 or 4 hours and i skipped the pan proofing the second time. The bread doesn’t seem like it is rising enough, but the crumb is open even though it’s gummy. I did this first in a pyrex 9×5 and then in a steel 8.5×4.5 and both results were gummy even with cooking to internal temp of 210. it doesn’t seem like the loaf falls, it has a nice rounded top that stays that way. Sorry I’m running on. I’m just so lost! Also, my loaf looks much darker than what you have here! Why would that be?! This recipe really interests me but all I can lay my hands on are the oats and all purpose flours. Can I use these? Hi following yesterdays post today I managed to get hold rice and potato flour. Can these be used instead of the eikon? If you use yeast vs starter, what makes it sourdough? …the 2-5 hour rest? I can’t wait to try this. My sourdough starter is needing a first use, and this looks like what I want to try. I started the sponge tonight, and will let it sit on the freezing cold kitchen island tonight, (it is -18 degrees here in Iowa tonight) and hopefully it will be good to go in the morning. I will try to take pictures and post as I go along. Thank you for the lovely post. I would really like to find a loaf recipe that my husband likes. Has anyone made this and just had it turn out like soup ? I am wondering if the amounts of flour/water listed are correct. Even for my sponge, 1 cup of water to 1 cup of spelt flour is just really watery and thing for me. The resulting bread doesn’t even rise. Genet, mine didn’t turn out like that. It did rise, but not as much as I’d hoped for. I do hope you can get it to work for you – it’s incredibly good and my family’s new favorite. Hopefully, someone else will have an idea about what went wrong and can help you out. I’m pretty new to bread baking and I’m struggling to learn how to make sourdough breads with some height. 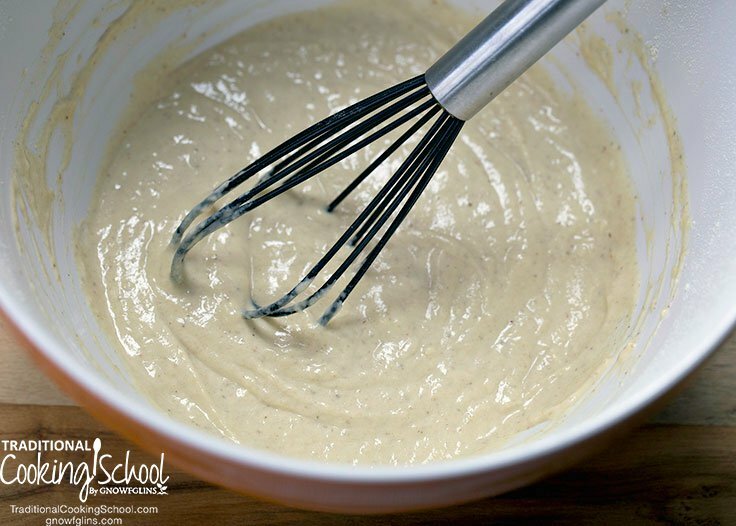 Since this dough is so different – like batter – how do you know if it’s done rising after you’ve mixed all the ingredients? Also, do you use a 9×5 pan or 8×4? Thank you for all the helpful pictures! If I am grinding my own Spelt and Einkorn…When you say “all-purpose” do you mean with all the bran and germ sifted out of freshly ground flour – so that the whole grain flour is now a “white” flour version? Thanks! ? I have found and this recipe is no exception that making Einkorn bread is going to produce a heavy bread that crumbs and dries out fast, that’s just the nature of Einkorn and the lower gluten content. You aren’t going to end up with a light, fluffy loaf like in the store. I’ve tried numerous recipes and this by far is the easiest and I like the flavor because of the oat flour. I had to use all Einkorn, Spelt will make me react. So, if your looking for a light, fluffy Einkorn bread, good luck. If I want it for sandwiches I use it the first day for that and toast the rest of the loaf. 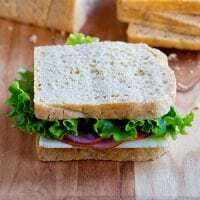 Being GF I’ve learned to live without bread for sandwiches I refuse to use the “GF flour mixes” that are full of starch and stuff I don’t care to consume like rice flour. For me this recipe is a keeper and will use it in the future for my bread. I think theres a mistake in the amounts of igredients in this recipe. I made this and it was very runny. Went ahead and baked it knowing something was wrong and it turned out yummy and never baked. I have read the comments here and a few people have had the exact same problem. Could someone please check this recipe and correct any mistakes because its costing people time and money. Looks like a great recipe if it was corrected. Would love to have it. Thanks. I noticed that some of you were experiencing a gummy bread. One tip I’ve learned is to wait at least 2 hours before cutting the bread to avoid gumminess. Can I add sweetener and oil to the recipe? We aren’t used to sourdough sandwich bread and wondered if adding a bit of sweetener and oil will make it more like we are used to.